There are many ways by which recent Indian Diaspora is building their community in their countries of adoption. Divided by caste, religion, and language, associations of Indians who migrated to nations around the world build temples, gurudwaras, mosques and Christian Fellowships, etc., to carry on their traditional worship and build their community around such ventures. Replicating places of pilgrimage in India and sanctifying them as sacred places of equal and substitutionary importance in countries of their adoption is also noticed. Social gatherings, celebration of holy days, distribution of Indian food and delicacies, fashion shows, cinemas, running and meeting in Indian restaurants, and even doing some social service activities along with the major communities of their countries of adoption are some of the ways that have been popular in building community. Visiting friends and relatives continues to be a great way to build communities. Distribution of reading materials in English and Indian languages, holding language classes, Yoga practice, visiting classrooms to tell about India and its culture, and so on occupy an important place in the lives of the Diaspora. Members of recent Indian Diaspora form a class of their own, and their economic position and working conditions are certainly better than the socio-economic position and working conditions of early Indian migrants to other nations. Building community meant something different in those contexts. People needed skills, encouragement, and guidance for proper living in the newly adopted countries. Most of the early migrants had to undergo social and economic hardships. They needed to change their perception to face the future courageously. While caste and religion provided some support even in the countries of adoption, they also were in need of modernizing themselves in many ways. How these early migrants met this challenge in their countries of adoption is yet to be written in detail. What was the role of written language (written materials) in the midst of poorly educated migrants? How did the emerging means of communication such as radio help in community building? How did they build relations with the surrounding non-Indian communities? Early writers of literary works among the Tamils in Singapore offer some great insight into story construction that focused on community building in subtle and not so subtle ways. N. Palanivelu's contributions to the development of Tamil literature and Tamil studies in Malaysia and Singapore are still under study. As a creative writer, Palanivelu excelled in various literary genres, but drama should be considered his forte. His themes always had a social purpose, that of encouraging the Tamil settlers to pursue their livelihood joyfully with courage and conviction and in a very diligent manner. While the unity of Tamils in their land of adoption was not explicitly emphasized, he seemed to approach the matter through community building as individuals and as members of their society. If Tamils do well, then, Tamil will survive and Tamil civilization will prosper even in their country of adoption, appears to be Palanivelu's assumption and dogma. A good part of Palanivelu's plays were written at a time when the Tamils in India were stirred by the revolutionary social reformist ideas of Periyaar E.V.R. and his great lieutenant C. N. Annadurai, fondly remembered as Anna, "Elder Brother." Periyaar was "thanthai" (Father) and Annadurai was "Anna" (Elder Brother) and the Tamil dogma propagated by them declared that all Tamils were brothers and sisters, leaving aside their caste orientations, etc. Their economic ideology was a mixture of Tamil nationalism, somewhat modeled after the then prevailing Swadeshi Indian nationalism (which supported native handicrafts, agriculture, etc.) and Marxism. Agnosticism, if not atheism, was their determined approach to everything religious. Millions were attracted to the ideology, and naturally, as a young man of vibrant ideas, Palanivelu was also attracted towards this ideology. It was but natural, then, that some of Palanivelu's plays were influenced by the themes and events in the plays of the British Marxist playwright Patrick Hamilton, in addition to the writings of Periyaar and Anna. As I read his works, I see this to be the significant focus in Palanivelu's writings: Moving to another land, and accepting this new land as his country of adoption, entailed a reconsideration of emphasis that Palanivelu should have in his writings. Building community in his country of adoption became the major undeclared focus of Palanivelu's writings. Generations will read his literary works and will find in them how Malaysian and Singapore Tamils struggled to eke out their living, and how their spirits are encouraged through community building through entertaining stories and plays. One of the ways that Palanivelu adopted in his ceaseless effort to entertain and instruct in order to build community was to avoid any emphasis on the caste background of his characters. He succeeded in many stories without referring to the caste background of his characters. For example, in the play "One Among the Thousand Girls" or "One Among the Thousand Women," Palanivelu focuses more on the themes of marriage between older men and young women, determination and dedication to pursue one's life ambition or career, and on the zeal to pursue research to find modern cures for incurable diseases such as leprosy. The ideal of a woman presented here is one of great determination to pursue her own career and achieve some social good through possible discovery of medicine to cure incurable diseases, or karma viyaathi "diseases due to karma." 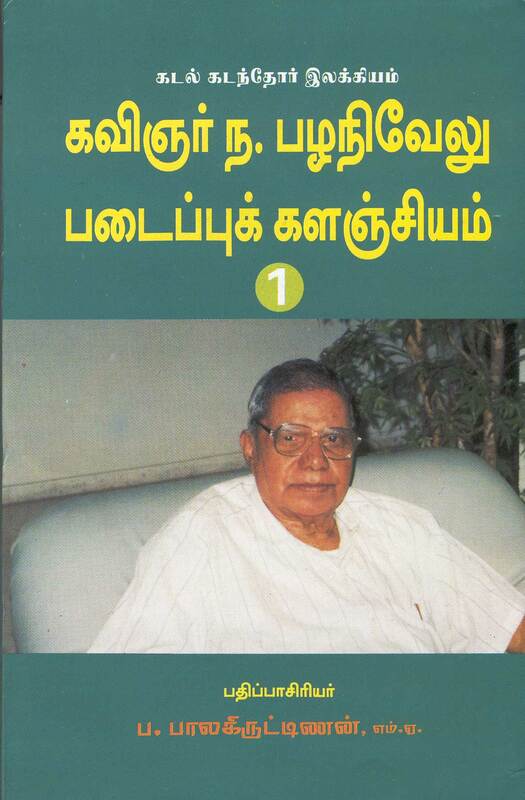 Palanivelu could have easily used caste dialects to reveal the caste background, but following the emerging but nascent tradition of using standardized colloquial Tamil he did his best to move the story forward without needlessly focusing on the caste backgrounds. Palanivelu's plays were meant originally for broadcast in Radio Singapore. It is not clear whether the tapes of these plays were preserved or not. Radio plays are an important segment of Tamil literature in Tamilnadu, Tamil Eelam (Sri Lanka) and other nations where the Tamils are settled. While traditionally Tamil literature is viewed as having three major parts, Poetry, Prose and Drama, the development of drama as an important genre became a reality only in the last 200 years or so. Radio plays significantly advanced creativity and innovation, and covered a wide range of themes. Palanivelu used the opportunity to entertain, instruct and build the community of Tamils in Singapore. The play with the title Lesson is an excellent piece depicting certain traditional characteristics usually assumed and ascribed to lowly clerks in offices. A straightforward clerk portrayed in this play is always under the fear of getting sacked from his position. His family depends on the meager income from his job. He probably represents the vast majority of law abiding individuals in the Tamil society: earning their livelihood doing honest work, but always they have fear and worry about how their bosses would view their work. The head clerk, a trickster, takes advantage of the timidity of the clerk. Through some interesting incidents the clerk gets the courage to speak out boldly for his rights, mainly because his young son showed that kind of courage against the bully he encountered. Conversations in this play are superbly done. The characteristic fear, timidity, and an unwillingness to confront when injustice is committed are all interestingly dealt with. Palanivelu uses even caste markers (physical appearance of having a strong and bold moustache, a coarse and blunt language, etc., assumed to be typical of certain castes in the districts of Tamilnadu) to develop his story, but he does this deliberately to bring these markers to our notice to prove that our assumptions regarding certain castes and their outward appearance are quite misleading and have no real validity in reality. An amazing technique of representation and education. Palanivelu's language is simple, and his dramatic techniques are also very simple. His plays certainly reveal that he deliberately cultivated a simple language and interesting plots to make best use of the convenience and constraints of the Radio medium. Hopefully scholars will separately deal with these aspects in due course. However, the ideas behind his plays are complex and instructive. Several of his plays are humorous, while educating the readers, listeners and viewers. The events that he dealt with were very much contemporary to his audience and reflected the material reality of the life of the Tamils in that period. It may not sound terribly contemporary at this moment, but when one gets into the stories and plays, we all will see their relevance even today for interpersonal communication, setting personal goals, and doing our best to achieve them. He was writing to a poorer and less affluent audience than we have now among the Tamils in Singapore. But the overall goals of his instruction and values are very relevant to continuously build the community even today.